The The Beast of Bodmin might be Cornwall's most famous big cat, but if you want a guaranteed sighting of an exotic feline in Britain's south west peninsula, Newquay Zoo is a much better bet. So when we visited Cornwall last weekend, my mum, Wilf, Ossie and I headed to the UK's surfing capital to catch some wildlife, rather than waves. After all, November can be a bit chilly for the beach! 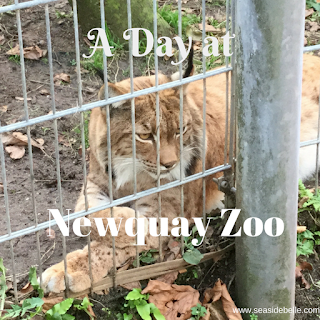 Newquay Zoo is home to over 1,000 rare and endangered animals ranging from penguins, monkeys and zebras to frogs and birds along with several big cats; as well as lynx and fishing cats the zoo is home to three lions, so we were spoilt for choice on the big cat front. There are plenty of opportunities to find out more about the animals living at Newquay Zoo with regular talks and feeding times throughout the day. And because Newquay is a relatively small zoo compared with Bristol and Paignton, you don't have to plan your visit with military precision to catch them all. As well as being informative, the talks are also entertaining and interactive with questions encouraged. We arrived just before the meerkat talk and learnt why meerkats do not make great pets and about the mob that live at Newquay Zoo as they tucked into their lunch of fruit, veg and live crickets. 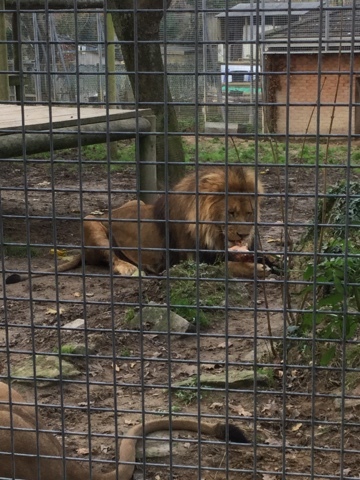 However, the highlight of the day was the lion feeding. Newquay is home to one male and two females who originally came from Longleat. 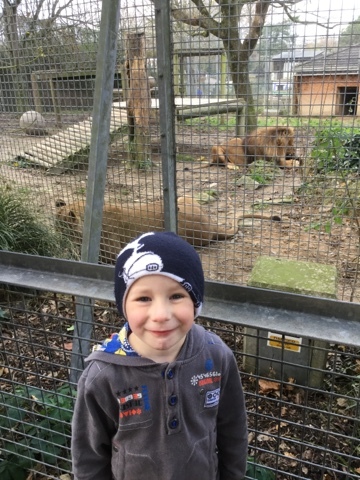 Because the enclosure is relatively small, you are guaranteed a good view as the lions raced in to tuck into a hearty bit of Dartmoor and Exmoor pony. Wilf is pleased he's not on the lions' menu. We also learnt about their strength as we were shown the mangled state of one of the balls they play with for enrichment (as if the crack of bone as the male tucked into his horse leg wasn't enough to remind us of the power of their jaws!). Newquay's male lion enjoying a spot of lunch. Even at enclosures where there were no talks, keepers were happy to talk about the animals in their care and answer questions. 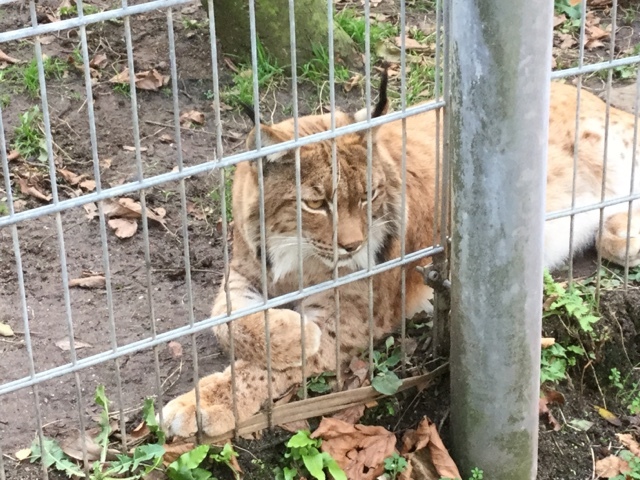 If you want to get into the enclosures, you can sign up to be a keeper for the day. Or you can walk among the birds in the Gems of the Jungle exhibit, which opened last year. Seeing all the animals get their lunch made us a bit hungry too. 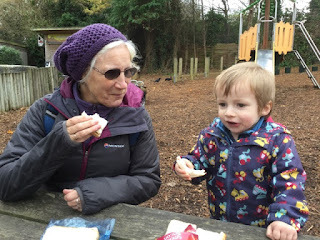 There's a cafe on site as well as several kiosks selling food and drink (although these were closed as it was November), but we had brought a packed lunch and there were plenty of picnic benches where we could sit down and tuck into our grub. Watch out for the local wildlife though! I nearly lost my sandwich to a seagull. Feeding time for mum and Ossie. 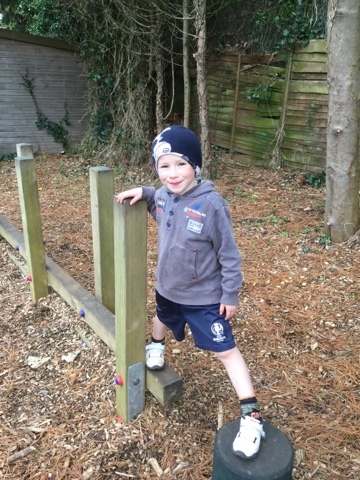 Having seen lots of animals clambering and climbing on the equipment in the zoo, my little monkeys were keen to stretch their limbs and the play area near the lion enclosure served us well with slides, a see saw and a variety of things to climb on that were suitable for all ages. 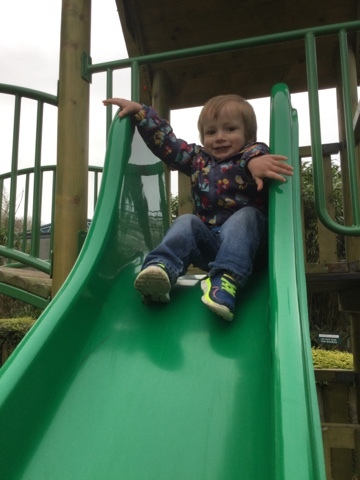 Ossie enjoying the slide in the play area. Cornwall in mid-November is a bit chilly, so after a few hours in the cold air, we decided it was time for a hot drink. So we headed for the cafe near the exit where we indulged in a hot chocolate with liberal sprinklings of chocolate, whipped cream and marshmallows. 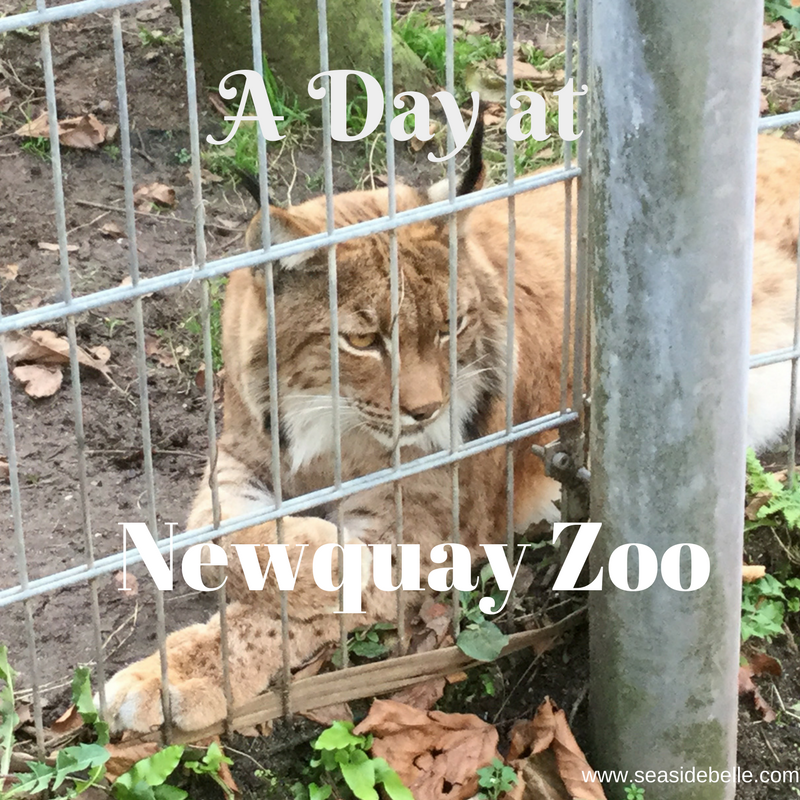 The perfect way to end our visit to Newquay Zoo. 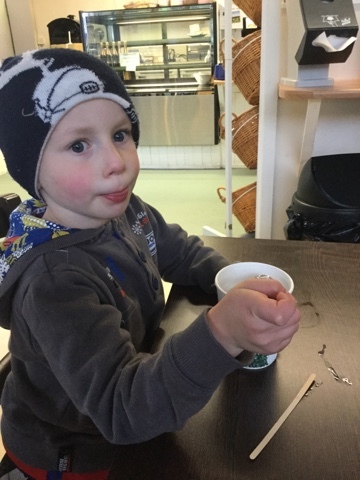 Wilf enjoying his hot chocolate. This zoo looks lovely. We've always driven by it and not ventured in but I must visit the next time I'm in Cornwall.